CANTF2 is an "all-hazards" Disaster Response Team, which can respond as a whole or in a combination of specialized modules. With over 140 highly-trained members and over $5 million in specialized equipment, that is packed and ready to be deployed, CANTF2 can respond quickly with the right people and the right equipment for almost any disaster situation. Can-TF2 is one of five Heavy Urban Search and Rescue (HUSAR) teams in Canada. The additional three teams are located in Vancouver (Can-TF1), Toronto (Can-TF3), Manitoba (Can-TF4) and Montreal (Can-TF6). Collectively, these teams lead Canada's emergency response initiative in Urban Search and Rescue (USAR). 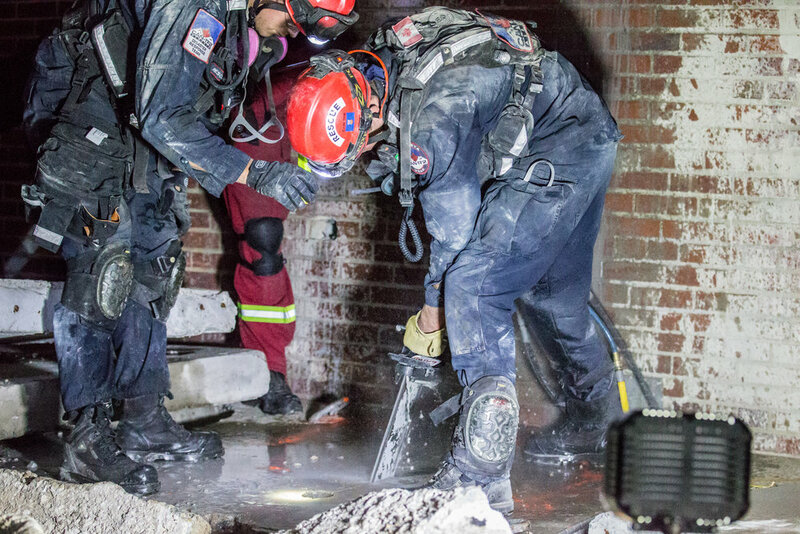 HUSAR Task Forces locate trapped persons in collapsed structures and other entrapments using specially trained dogs and electronic search equipment. The Task Forces breach, shore, lift and remove structural components, use heavy construction equipment to remove debris, and medically treat and transfer victims. As a HUSAR team, Can-TF2 responds with up to 70 specialized team members within 6 hours, via ground or air, and operates 24 hours a day for up to 14 days with the specialized equipment to be fully self-sustaining. CanTF2 provides both rescue and recovery during flood events. Our team of boat crews can use any or all of our five (5) zodiac boats to navigate floodways seeking out people who have been trapped by the rising waters. Crews search affected houses and buildings quickly and efficiently in areas that are normally difficult to access and citizens can be shuttled to evacuation areas quickly and efficiently with patient and rescuer safety in mind. While search and rescue operations are underway, CanTF2 Logistics crews can begin to use any or all of our 23 large volume trash pumps to protect critical infrastructure and begin pumping out priority buildings. Our fleet of large pumps can move 850 gallons per minute (3200L/min) of dirty, debris-filled flood water in order to quickly remediate a flood situation. Within CAN-TF2 is a group of Physicians and Advanced Care Paramedics who use specialized training to deploy a wide range of medical equipment in support of emergency incidents or planned events. With the capacity to set up a First Aid post, Advanced Life Support medical tent, or casualty collection point, our medical team provides the highest level of care available in the field. In order to provide self-sustaining support to our 70 member team for up to 14 days, we have a variety of equipment that can be modularized to support smaller incidents as well. With a wide variety of communications equipment and the support of our highly trained Communications Specialists to manage it, CANTF2 can provide numerous systems to support a diverse communications network during an emergency or large planned event. Canada Task Force 2 is on the Alberta First Responder Radio Communications System (AFRRCS). AFRRCS is a province-wide two-way radio network that allows first responder agencies (fire fighters, police, ambulances etc.) in the province to use the same radio communications technology. It ensures first responders can more easily communicate with one another and improve coordination among agencies. CanTF2's search dogs are a critical element of our team as their keen sense of smell allows them to quickly locate victims that might go undiscovered. All of the dog handlers on our team are civilian volunteers. The dogs are considered to be family pets by the handlers when the dogs are not on duty. When on duty, these highly-trained dogs can quickly and effectively search collapsed buildings or evacuated areas for people who may be trapped. Along with Search Dogs, our Technical Search Specialists use highly specialized equipment to search for victims of a disaster. Using sensitive acoustic and seismic devices, the Search Specialists can narrow down the areas where trapped patients may be. Then, using telescoping and articulating-head cameras, the team can visualized the full patient situation and begin planning for the rescue. Combined with the team's Search Dogs, these Technical Search Specialists make up our highly-trained Search Team. CanTF2 Rescue Specialists are trained in rope rescue for the primary purpose of gaining access to patients in confined spaces or collapsed structures. Rescue Specialists can create rope systems which enable them to work and use heavy rescue equipment in areas that would otherwise be inaccessible. These Rescue Specialists can then also create rope systems that can be used to lift, move and lower patients out of danger and into safe areas for treatment.